Playing It Cool (formerly known as A Many Splintered Thing) is a 2015 American romantic comedy film directed by Justin Reardon and written by Chris Shafer and Paul Vicknair. The film stars Chris Evans, Michelle Monaghan, Anthony Mackie, Aubrey Plaza, Patrick Warburton, Ashley Tisdale, Ioan Gruffudd, and Topher Grace. The film was released on video on demand on March 31, 2015 before a limited release on May 8, 2015 by Vertical Entertainment. Me (Evans) is a screenwriter who wants to write action flicks, but his agent, Bryan (Mackie), wants him to write a romcom first. However, He doesn't believe in love and finds writing about romance difficult. But when he meets Her (Monaghan), he falls in love with her, only to discover that she is already engaged to Stuffy (Gruffudd). The script for the film was originally titled A Many Splintered Thing and was first on The Black List and was a 2011 finalist for the Nicholl Fellowship. The film began filming in late 2012 in Los Angeles and completed in early 2013. The film is produced by Voltage Pictures and Wonderland Sound and Vision. The film was released in Estonia on September 26, 2014, Latvia on October 17, 2014, South Korea on October 23, 2014 and Romania on December 26, 2014. The film was released in Sweden on February 26, 2015 on DVD and Blu-Ray. The film was also released in Bulgaria on March 6, 2015 and in Singapore on May 7, 2015. The film was scheduled to be released in Chile on May 28, 2015 and Brazil on June 11, 2015. on November 5, 2014 it was announced Vertical Entertainment had acquired US distribution rights for the film with a planned 2015 release. in February 2015, the film was released exclusively on DirecTV Cinema. The film was released on video on demand on March 31, 2015 before a limited release on May 8, 2015. The film premiered at the Dallas International Film Festival on April 11, 2015. The film was released in a limited release and on video on demand in Canada on February 27, 2015. The film was largely panned by critics. On review aggregator Rotten Tomatoes, the film holds an approval rating of 14%, based on 28 reviews with an average rating of 4/10. 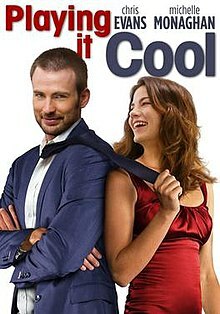 The website's critical consensus reads, "Playing It Cool pits Chris Evans and Michelle Monaghan's easy chemistry against a screenplay that tries too hard to be quirky and clever, and the results are disappointingly lukewarm." On Metacritic, the film has a weighted average score of 29 out of 100, based on 9 critics, indicating "generally unfavorable reviews". The international trailer was released on September 17, 2014. The film was released in Sweden on February 26, 2015 on DVD and Blu-Ray, and was scheduled to be released in the United States on June 16, 2015 on DVD. The film was released on DVD in Canada on May 5, 2015. ^ a b H. Shaw-Williams (September 2014). "'Playing it Cool' Trailer: Chris Evans & Anthony Mackie Reunite". Screen Rant. Retrieved 23 September 2014. ^ a b c d e f g h Ryan Gajewski (13 September 2014). "Chris Evans Has Complicated Feelings for Michelle Monaghan in 'Playing It Cool' Trailer". The Hollywood Reporter. Retrieved 23 September 2014. ^ Kevin Jagernauth (12 September 2014). "First Trailer For Rom-Com 'Playing It Cool' With Chris Evans, Michelle Monaghan, Aubrey Plaza & More". Indie Wire. Retrieved 23 September 2014. ^ "Playing It Cool (2015)". Rotten Tomatoes. Fandango Media. Retrieved June 28, 2018. ^ "Playing It Cool Reviews". Metacritic. CBS Interactive. Retrieved June 28, 2018.